Since 2009, The Butterfly Trust has worked with local communities to improve their access to health care and education – primarily in Vanuatu. We work in close collaboration with government ministries and other NGOs to avoid duplication of resources and programmes. This work would not be possible without the people and organisations that support us. If you would like to join our community, please get in touch. We would love to hear from you. We believe that education is the key to individuals becoming self-determining and free of outside aid assistance. In some countries, such as Vanuatu, school fees are expensive and parents struggle to pay them. Therefore, since 2012 the Trust has been subsidising secondary school fees for students from the Maskelyne Islands. The Butterfly Trust, by way of academic and hardship scholarships, supports primary school leavers so they can attend secondary school. At present the Trust is paying up to one half of the secondary school fees of 25 pupils. Read more in our 2017/2018 newsletter. Three pupils from the Maskelyne Islands, whose secondary education was subsidsed by the Butterfly Trust, have now gone on to receive government scholarships to study at university in Fiji. In 2014 we also started a programme training kindergarten teachers. This programme is run in partnership with Pikinini Playtime, a kindergarten in Port Vila, Vanuatu. In 2015 this programme was extended to training kindergarten committees. Read more about this programme in our 2017/2018 newsletter. To supplement our actual learning programmes, we have also, in the past, helped small village schools improve their facilities. For example, Namaru Primary School has 6 classrooms. The Trust has supplied solar power to light up 4 of these classrooms and the school office. Learn more. However, we now prefer that local communities finance their own infrastructure developments wherever possible. We are always available to help, when requested, with planning and accessing avenues of fundraising and funding. One of our regular medical volunteers, physician Dr Michael Kahan, recently wrote an article for NZ Doctor. To read the article click here. The Trust is also supporting ASSB (Aloha Social Services Bangladesh) by recruiting doctors for long-term placements in rural Bangladesh. If you would like to volunteer, or know someone who may be interested, please contact us. The Trust believes that vocational training is just as important as academic training. Consequently, it has supported a number of vocational training courses in Vanuatu over the years, including building, generator maintenance, dress-making, and solar power installation and maintenance. Following Cyclone Pam in March 2015, we worked closely with a number of participants in the Shelter Cluster (now known as the Housing Working Group) to provide “build back safer” education to communities in peri-urban Port Vila as well as the outer islands. These courses served to improve the disaster resilience of the local building stock as well as improve the skills of community builders. See our 2016 newsletter for more information about “build back safer” education. We concentrate on assisting communities to develop in their own way, at their own pace. However, when a natural disaster strikes, as category 5 Cyclone Pam did in Vanuatu on 13 March 2015, we support the relief and recovery operation as much as possible. During the relief and recovery operation, we remain mindful of the need to assist communities in the long term, so our relief and recovery programmes are, wherever possible, designed with an eye to ongoing future assistance. Learn more about our work in the aftermath of Cyclone Pam in 2015. Learn more about our work following the Ambae volcanic eruptions in 2017/2018 and the evacuation of that island. Visit our Media page for more video footage. Transport around Vanuatu’s 83 islands is very costly for many ni-Vans. Here, head teacher of Aulua School, Mr Benson Tangou, and fellow head teacher of Akhamb School, Mr Ivan Meltely, hitch a ride on Rireana to Port Vila to purchase school supplies. 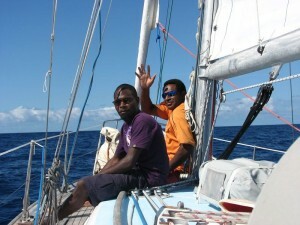 We use our yacht as a base for the work of the Butterfly Trust in Vanuatu. Browse our Sailing Log for more.